Another warm Saturday, especially for the time of year (18 degrees) so a bit more time in Huntsendgarden. A bit of tidying up. Trimmed the front hedge and cut back the plants against the front of the cottage. Dead headed the Hollyhocks and the Acanthus. In the back garden I trimmed the blackberry runners that were hanging from the cooking apple tree. 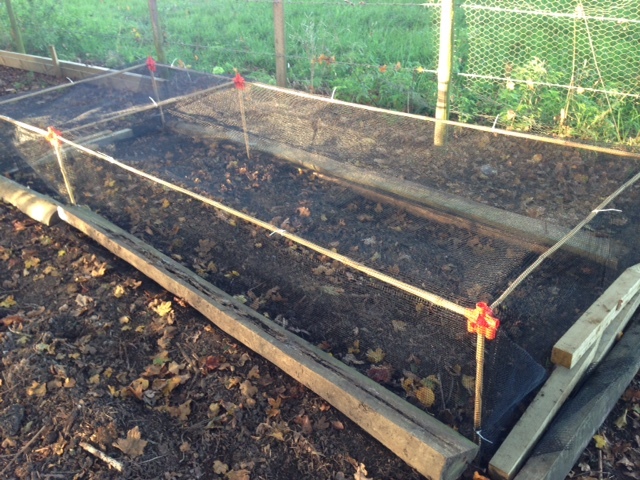 The connectors to make the frame for netting the vegetable patch arrived during the week so I constructed a simple frame with bamboo canes and some netting from work. Hopefully it will protect the garlic and onions when they start to sprout from next doors chickens.